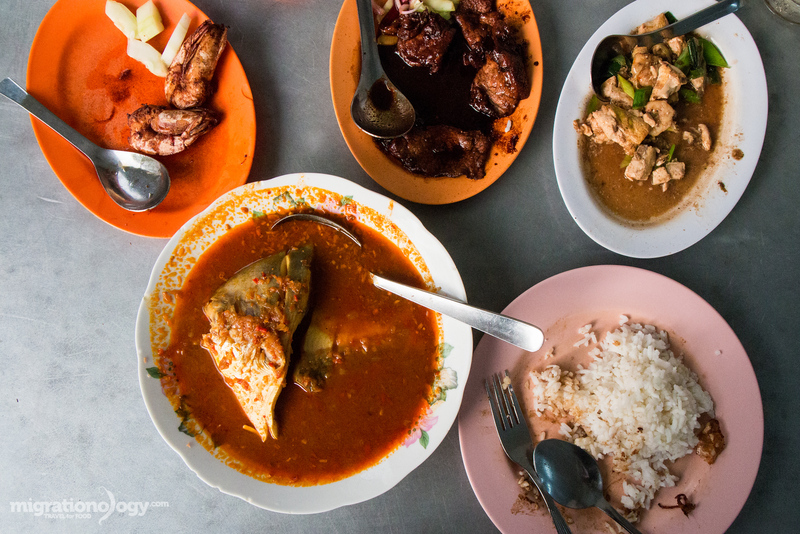 It seems that you can walk right past some of the best restaurants in Penang without knowing they are restaurants. That was certainly the case for a restaurant, located just off Chulia Street in the center of Georgetown, known as Shing Kheang Aun (新琼安饭店). Just like the old school charcoal steamboat restaurant (more about this place coming soon), which you could easily pass in the daytime and have no clue it was a restaurant, Shing Kheang Aun was the same. First off, I have to say thank you to the community at Foursquare for the tip to find this restaurant. It was coming to the end of our time in Penang, and I was searching for more places to eat by using the location search function. Not far away from where we were staying, I saw a restaurant right off Chulia Street. 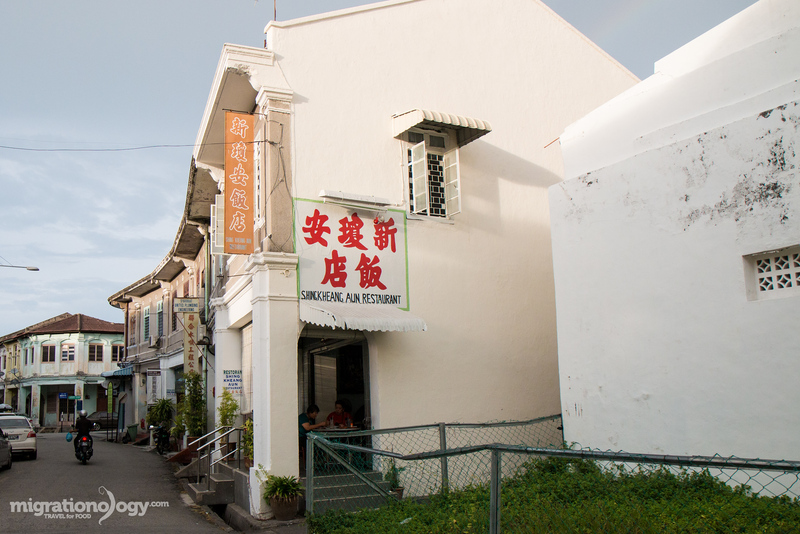 There weren’t a lot of reviews or comments, but the ones that were there said the food was old school and delicious, and one of the few remaining Hainanese food and Nyonya restaurants in Penang. Just about everything at Shing Kheang Aun was old school, from the non existent menu, to the spoons and forks. 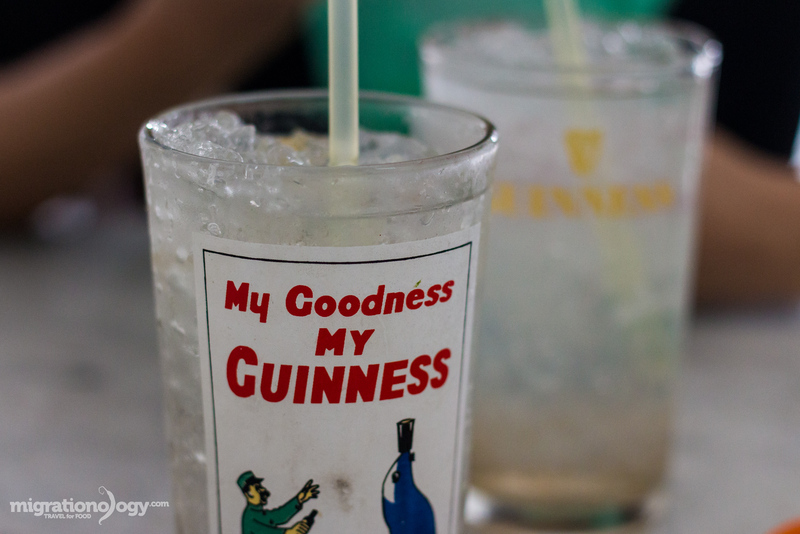 I also really loved how they brought me a glass of water in and old antique Guinness cup. That’s classic. 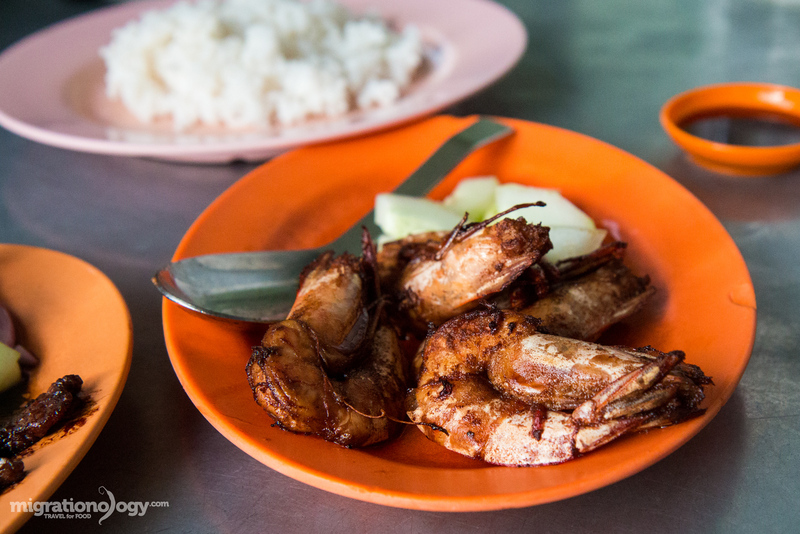 One of the best things about eating at Shing Kheang Aun is that there is no menu. When you sit down to eat, the owner of the restaurant just kind of comes over to your table and takes your order. Both ways work pretty well I think. When I showed up to eat at Shing Kheang Aun, from reading the reviews, I knew exactly what I wanted to order. Let’s begin with the tofu and leek. The tofu was soft and silky, almost the texture of pudding, yet less rich or creamy. 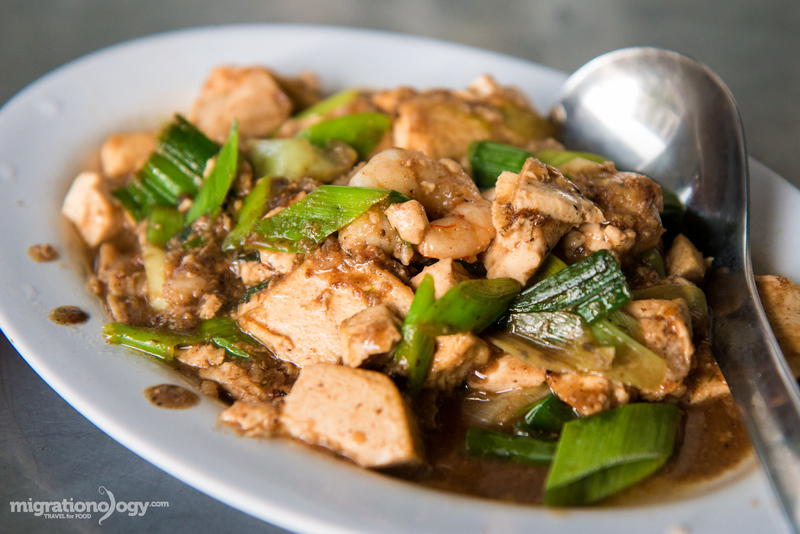 The big chunks of soft tofu were stir fried with slices of leek, some minced pork and a few shrimp. Although it sounds very simple, and it was, it was also incredibly good. Different from the fried braised tofu at Tek Sen (which was very good also by the way), this dish was stir fried, had just the right soy sauce saltiness to it, and all the textures went beautifully together. Additionally the tofu had a wonderful smoky flavor, perhaps it was stir fried over a charcoal fire instead of gas – which is quite possible, considering the old school-ness of this restaurant. Not too attractive in the photo, but it tasted good! 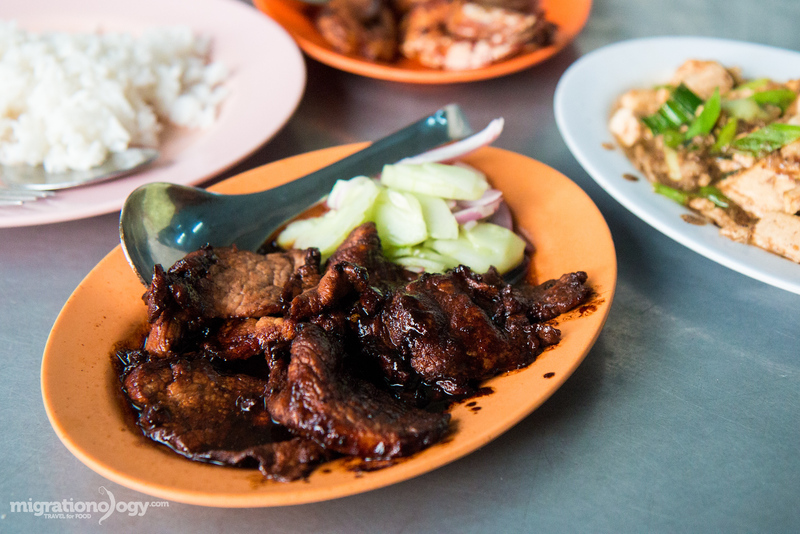 The reason I ordered the dark soy sauce pork was because many people had recommended it, saying it was a must eat and signature dish at Shing Kheang Aun. 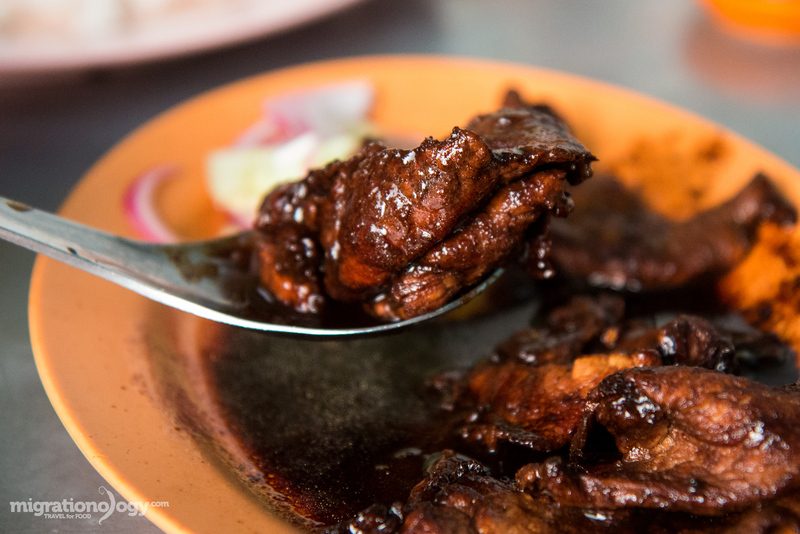 The pork was cut into big bite sized thin strips, then cooked (possibly stir fried) with a thick dark soy sauce that had a sweetness to it. The sauce almost had a slight burnt molasses flavor that also tasted like hoisin sauce to me, and the pork was nice and tender and lean. It was a little on the sweet side for my personal preference, but I still enjoyed it, and my wife really liked it. 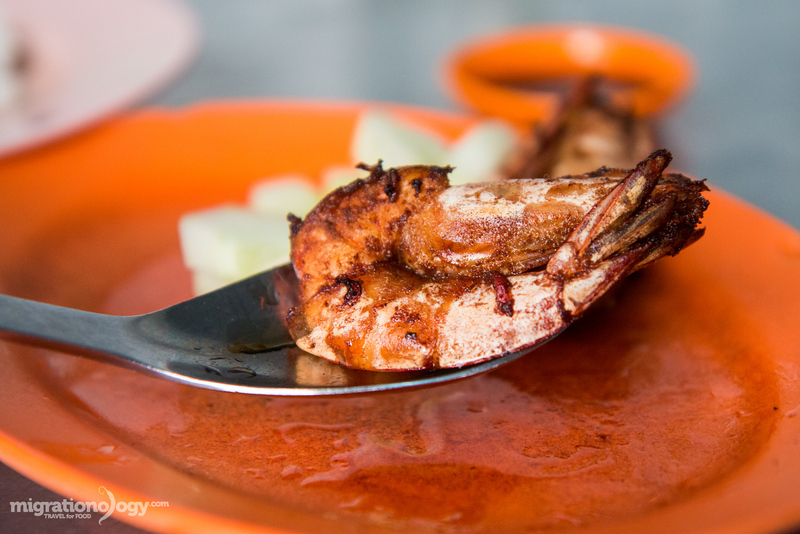 Assam prawns is a popular Malaysian Nyonya way to cook prawns. Assam means sour, and these prawns were cooked in a sour glaze – the sourness being from sour tamarind with soy sauce. I’m not totally sure of this, but I think the prawns were deep fried. 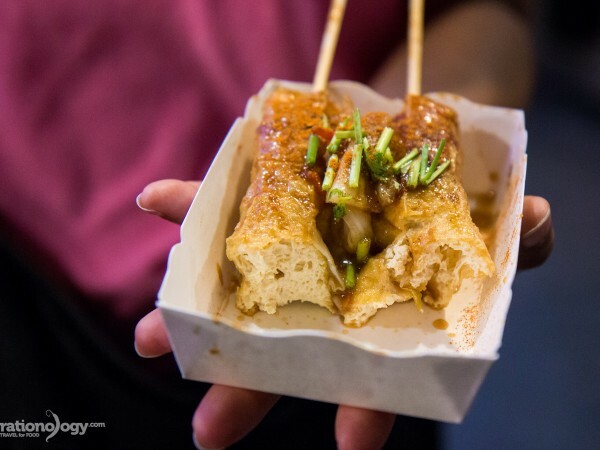 They were marinated in a combination of sour tamarind fruit, and probably some soy sauce and then fried. By the way, this recipe looks excellent if you want to make it. The prawns were dry, and the black glaze was kind seared onto the shell of the prawn and meat of the prawns. The flesh of the prawns was extremely meaty and muscular, just as wild caught ocean prawns should be, and although some of the glaze was on the outer shell of the prawn which I peeled, the flavor did come through to the prawn. The glaze had a light fruity sourness from the tamarind and a it was salty from soy sauce. Excellent. There was also a sour chili sauce which also went well with the prawns. Although fish curry is one of my favorite things in the world, I have to admit that I almost didn’t order it here. I had been eating so much food in Penang, and I wanted to order less this meal, know that just being my wife and I eating, we didn’t need that much food. 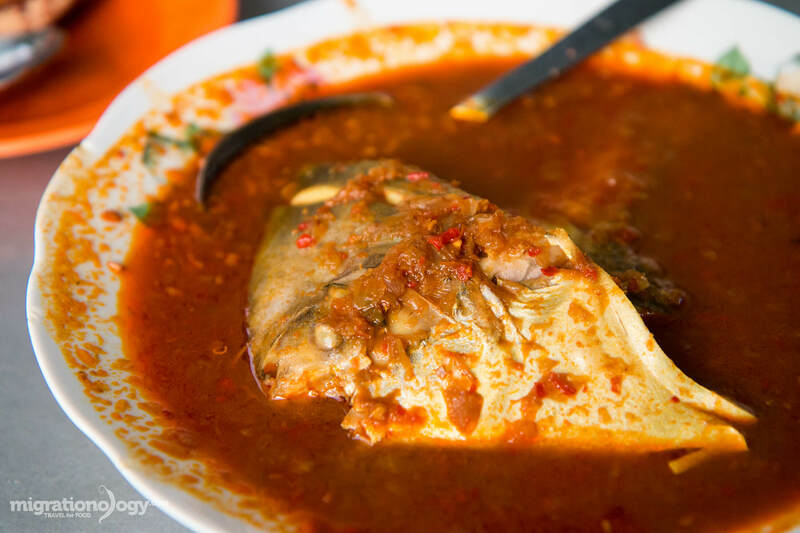 But as I took the first few bites of the food and I saw another table eating, there was nothing I could do from holding myself back from ordering a plate of the fish curry. I’m glad I didn’t hold back. It was the dish that literally made Shing Kheang Aun one of the best restaurants in Penang for me. The fish curry had to be one of the best dishes I ate in the city. Period. The fish, which was a good sized pomfret, was curried in an incredible blend of spices, herbs, and ingredients. It was salty, filled with onions, and there was one distinct herby earthy flavor that I had tasted before, but it took me a few minutes to figure out what it was: torch ginger flower. In Thailand, torch ginger flower is commonly used in rice salad in southern Thailand, but I don’t think I had ever had it in a curry. The flower gave the curry a nice sourness and unique earthy aroma. 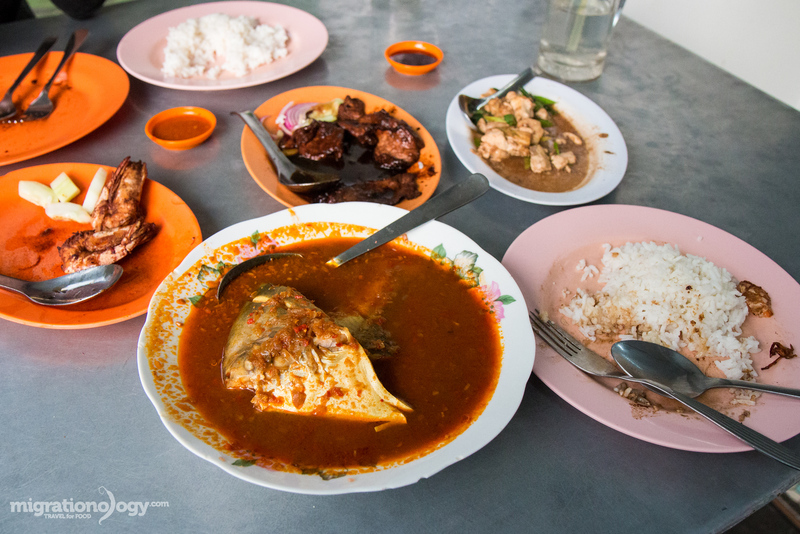 This fish curry was seriously was one of the best dishes I ate in Penang. Mentioned above was all we ate during our first meal here, but Ying and I loved the food so much, especially that fish curry, that we returned the next day. Along with ordering the tofu and leeks and the fish curry, we also tried a few other dishes. 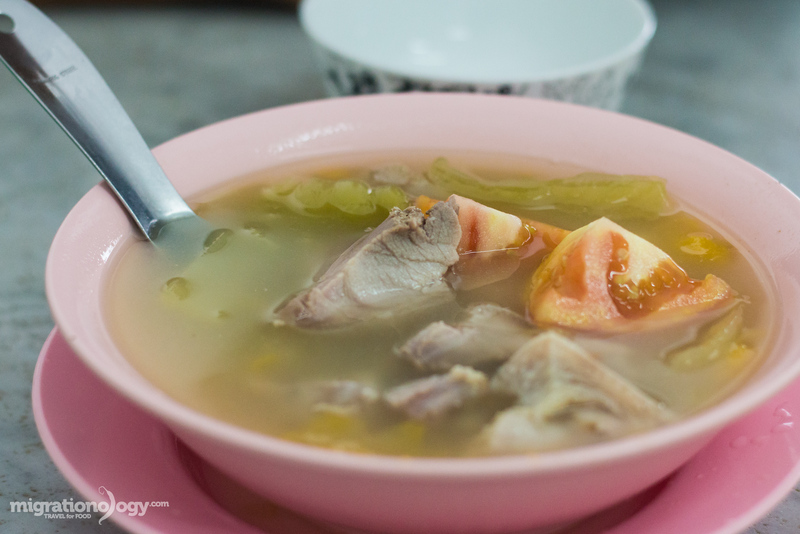 One of the dishes we tried the next day was a sour pork soup, made with pickled mustard greens and big hunks of fatty pork. The pork included the skin and all, and the soup was sour and rich. The pickled mustard greens were crisp and the pieces of pork that weren’t fat were tender and meaty. It was plain, just sour, but pretty good. The Malaysian Hainanese chicken chop is a dish that has some history attached to it. From what I understand, it came about in Malaysia during the British colonial period when there were many Hainanese working for the British who adapted some of their recipes. A chicken chop is basically a thin piece of chicken, deep fried to a crisp, then smothered in some kind of gravy sauce, and perhaps topped with some extra goodies like carrots and peas. The chicken chop at Shing Kheang Aun had a sweet tinge to the gravy, which I didn’t care for, but the meat was excellent and the mix of crispy fried pork paired with the gravy which made it a bit soggy was excellent. I just wish it had been less sweet. 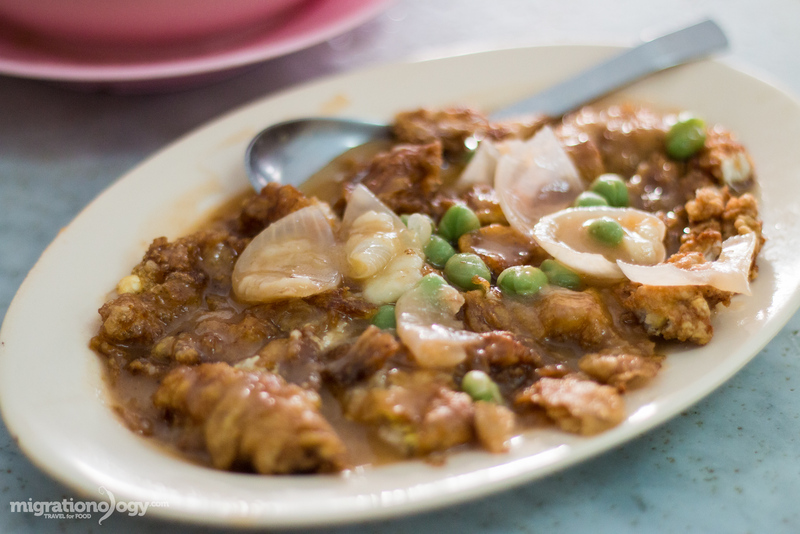 Shing Kheang Aun is yet another old school restaurant in Penang. 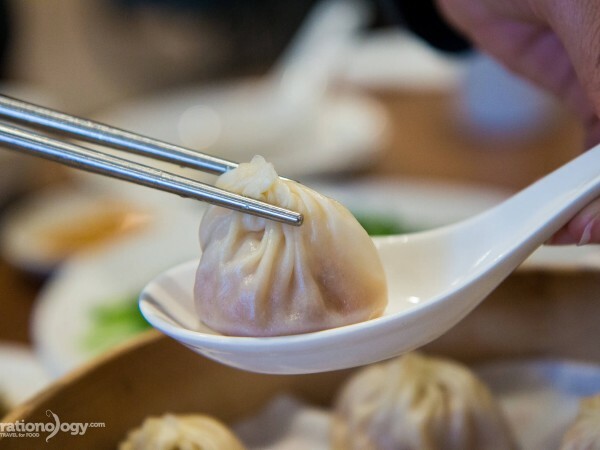 Located just off Chulia Street in the heart of Georgetown, it’s the type of restaurant you could just stroll right past without knowing they serve food. 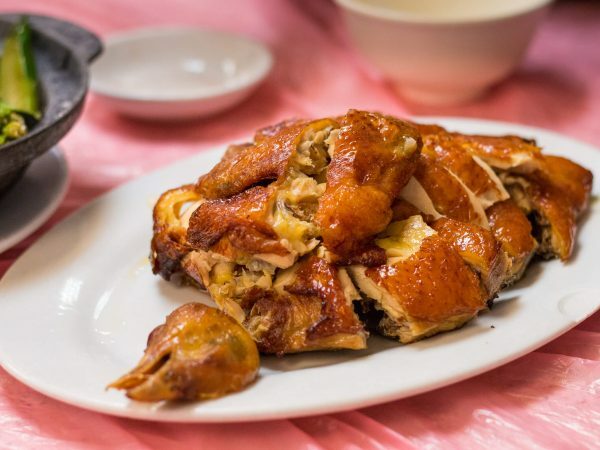 But in reality, they serve some seriously good food – a combination of both Hainanese and Malaysian Chinese, known as Nyonya food, and everything about the restaurant is old school. I really enjoyed the tofu fried with leeks, the crispy assam prawns, and the dish that took my breath away, the assam tumis fish curry. 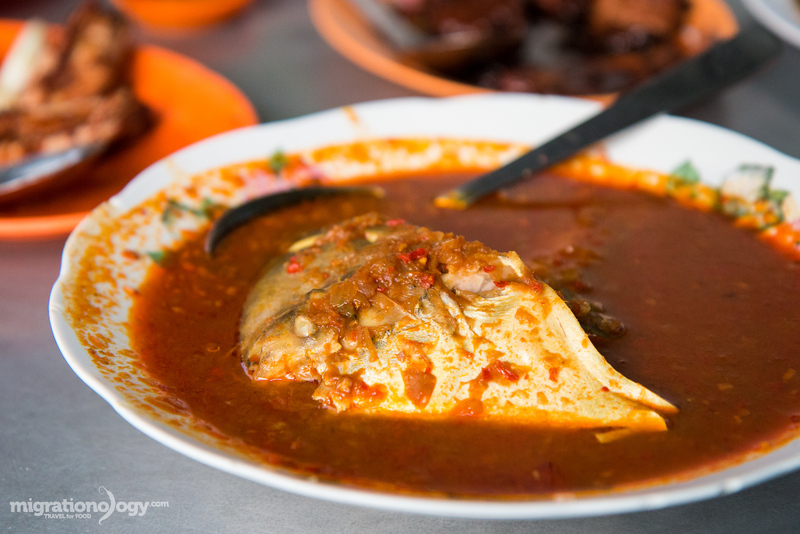 The flavor of that fish curry will forever be on my tongue until I re-visit Penang! Open hours: It’s hard to predict, so don’t take these hours too seriously. Typically for lunch from about 11 am – 1 pm and for dinner from about 5 or 6 pm – 7 or 8 pm (closed on Monday I think). For dinner come about 5:30 pm or 6 pm at the latest, we arrived about about 6:30 pm and we were the last table they served. They literally closed their gates and locked up right at sunset. Prices: Our total meal for the first 4 dishes in this blog post cost 58 MYR, and our next meal which included 4 dishes cost about the same. Not cheap and not expensive, but similar to other restaurants in Georgetown. How to get there: If you’re staying anywhere in central Georgetown, it shouldn’t be too much of a walk to get here. Where I was staying in Penang, at Armenian Heritage Street Hotel, it was less than a 10 minute walk. 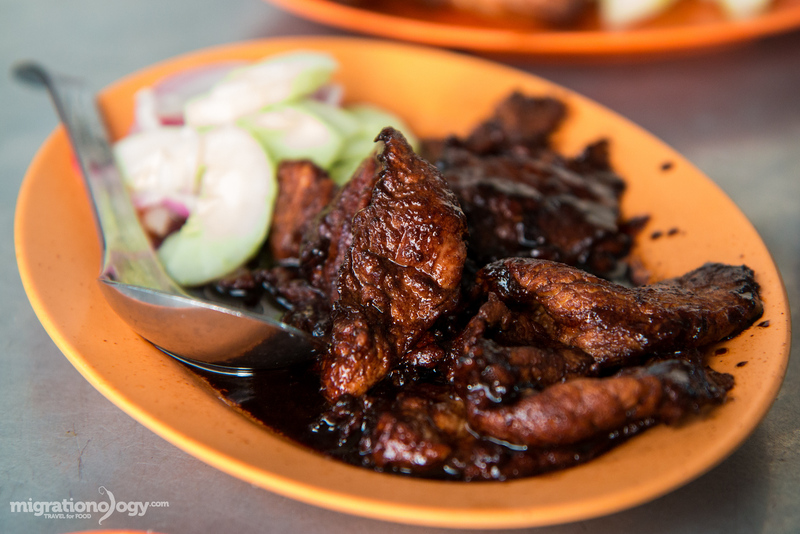 The restaurant is located just down Lorong Chulia from Chulia Street. Hainan chicken chop, chicken sauteed fish curry and sour shrimp seemed worth a try the food. I’ve been to this restaurant several times. I completely agree that the fish curry is the best! Hey Em, great to hear that, glad you enjoy the fish curry too. That restaurant is definitely authentic! My friends from Penang always tell me to have dinner there. Even my dad who was born in Penang acknowledges the traditional flavours maintained in their dishes. Hey Wen, this is great, thank you for sharing. It was some of the best food I had when I was in Penang. Glad you love Malaysian food too John! Really enjoy watching your videos! Liked and appreciated the way you make the effort to produce each video and blog post 🙂 you make everything clear and detailed. I’m going to visit Penang next month, I would like to find out how’s your hotel you both stayed? Clean room and specially bed sheets are important to me. I read it was in a great location but had some noise issues? Morning prayers, traffic and there’s lounge area in every floor? And wifi are bad? Thanks and hope to get your reply. Can’t wait to try out the food you posted specially that duck soup noodle! Hey Linn, good to hear you’re going to Penang, and thank you for watching my videos, really appreciate it. Our room wasn’t loud, but could be that some rooms are louder than others, and unfortunately the wifi was bad everywhere for me. But the hotel was very clean, as I remember the sheets were clean and the rooms included nearly everything we needed. Hope you have a great time and enjoy the food! These dishes all looked very “old school”, simple yet satisfying. They don’t look particularly appealing at first sight, but I’m convinced the flavors were amazing. I watched this video earlier and wasn’t struck by any of those foods you had, perhaps because of its simplicity and plain looks. However, I’m sure the secret lies in the depth of flavors and taste. Nothing fancy here, that’s for sure! Great to hear from you. 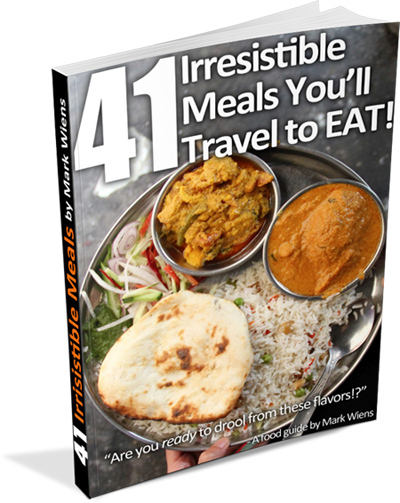 Yah I think that’s about right – most of the dishes, apart from the curry, are all quite simple, but just cooked perfectly, and for some reason they are hard to find cooked so simple but with so much flavor.